Looking at our numbers, I wanted to wait until we hit our goals–or at least had a clear trajectory–before I published another article revealing what was happening behind the scenes. On top of that, I never felt like I had the time to write another one of these entries for the Agency Journal. If you run an agency, you probably understand. You wear a lot of hats. You’re running around, trying to do 50 different things for clients, recruiting talent, and also keeping the plates spinning internally. Oh, and you probably try to live a life, too. But, my girlfriend reminded me of something important. Rule #2 from our values: Be human. In order for this work, I need to share the good parts of our progress–and the bad ones. It’s been nearly seven months since I last updated our agency journal and announced our goal to grow a $1,000,000 agency in a year. Suffice it to say that a lot has happened. I’ve learned a lot, both good and bad. Since the last update, we’ve grown a bunch and generated a lot more interest. Our own content has continued to bring in inbound leads, which has helped us grow our revenue. But, we’ve hit a lot of barriers. Unfortunately, we are a long way from our initial goal of building a $1 million agency. And I bear most of the responsibility for that. Our team has continued to deliver great content (and some amazing results) for our clients. But, it has been a struggle to translate all of the interest that we’ve received into actual work for the team. Let’s talk about what I’ve learned. This may be obvious to anyone else who has run an agency or service business, but I am quickly learning just how true it is. Since our official launch, we have had at least 34 sales opportunities that have entered our pipeline. (I’m only counting people who have reached out to us about working together). According to my records, we have turned away or referred about one third of those leads. Of the remaining 70%, we’ve had various levels of success. When looking at our pipeline of leads/sales, one thing sticks out like a sore thumb. We have way too many deals that are somehow stuck, on-hold, or blocked. Most of these are people who were gung ho to move forward and happy to hire our team. But, something is holding it up. It might be the final approval from an executive, temporary cash flow issues, or changing internal dynamics. But this bucket easily represents $30-40,000 per month in revenue, which is stuck in limbo. I think our agency is too young to know for sure. Many have expressed interest in still trying to move forward, but there’s no telling when that may happen. A few months ago, I shared that our team has decided to require a mandatory trial project for every new client. This move came from some early experiences we had with specific clients not being a good fit or not having a shared vision or expectations. As I explained in the original article, one of the most difficult parts of running and growing an agency is uncertainty. Losing clients can be devastating to any agency, so we want to avoid it as much as possible. So, trials have served their purpose. We’ve had a chance to work with each of our potential new clients first and see how things go, and then decide whether or not we should move forward. But, unfortunately, this also means that our growth and revenue have suffered. In addition to many of our projects being put on hold and our high standards for clients, we’ve seen a number of clients that didn’t turn into sustainable income as expected. The key for us moving forward is to refine this process. We need to do a better job of closing deals. Ultimately, that falls on me. I’m the salesperson for Optimist. We need to do more to keep the pipeline flowing and to qualify clients even before the trial project, in order to make sure that they translate into paying clients past that point. I consulted my incredible team. They’ve come up with some great ideas. The first and most obvious adjustment I’m making for the rest of the year is to try adjusting our sales process. I’m planning to continue to refine this process and may hire a sales coach or consultant to help. One of the biggest barriers that we have run into with regard to scaling revenue as quickly as we expected is that the deals we have signed have not been as large as we had expected. In my initial post about our goal to build a $1 million agency, I laid out the math: 10 clients at $10,000 per month = $1.2 million run rate. Since then, I’ve learned that the pool of companies willing and able to pay a full $10,000 per month is fairly small. Most of the inquiries we have gotten come from companies with a budget closer to $5,000 per month. Because of this, we’ve shifted our expectations. I updated the website to say that our work begins at $5,000 per month instead of 10. My hope was that we’d capture more inquiries this way. And, frankly, we were discussing deals below $10k/mo with most inquiries anyway. Obviously, this means we’ll need more clients in order to reach our goal. But, as the head of any agency quickly finds out, sales becomes almost your entire job. Thinking back to my approach and my own skills, I’ve realized that sales has definitely been a weakness of mine. As such, I want to make some changes. I’m hoping that these changes will allow us to put more opportunities in our pipeline. So, even if we only end up closing 10% of the deals that enter, we’ll still be able to add several new clients before the end of the year. Our content and marketing strategy for Optimist has been much the same as what we would prescribe to a client. We were (are) churning out content targeted at reaching our key buyer personas, doing content promotion/distribution, link building, etc. It has worked well. All of our business to date has come from inbound leads generated through our own content. But, as most agencies probably know well, it can be difficult to invest the time and money into your own marketing efforts when you’re trying to keep on top of client work, plan for the future, and stay focused on steering the ship. I’ve decided that for the remainder of the year, I’ll focus on creating and promoting 4 key, cornerstone pieces of content (each consisting of a few relevant articles and some curated resources). Although a lot of our clients rely on continuous content in order to keep traffic flowing and to build out their organic search footprint, our business is much lower volume than many others. We are really only looking for a steady flow of new business. Our goal is to reach 10 to 20 clients–not a million users. Because of this, I think it makes the most sense for us to build a content library up front and then slow down our content publishing schedule moving forward. So, for those reasons, we are shifting our strategy to focus on fewer, bigger content resources rather than a continuous stream of new content. Since we are still growing our own footprint, I’m going to shift a lot of my time and effort on content toward guest posting on other sites. This will help us generate more brand awareness and earn links and traffic to our site. The biggest update from a people and operations standpoint is that we now have officially moved all of our work to a new project management software–Asana. 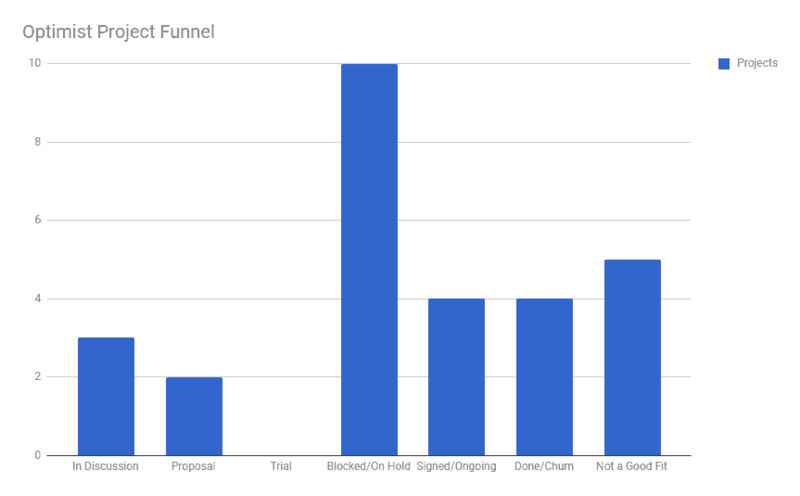 Our “light” stack using Slack, Trello, and Google Sheets was effective when each of our freelancers was working against a single Optimist client at a time. But, once we started to have writers and designers working on multiple clients, it became really difficult for them to track all of their tasks and due dates across multiple client Trello boards. Asana adds the individual task management view that we were missing with Trello, letting a writer or designer, for example, see all of the projects they are assigned in chronological order by due date, regardless of which client it’s for. Moving forward, this will be essential. We migrated just before bringing on a few new clients, which I think was perfect. As soon as we recognized that Trello wasn’t providing an adequate view for everyone to stay in sync, we evaluated our options. We had already been planning to consider adding a different task/project management solution to our stack. But, this accelerated the need for a new tool. I did consider a few other project management options. I investigated some tools like Percolate, built for content marketing management specifically. But, ultimately, the other options just felt too rigid. One of the core aspects of Optimist is being agile–removing beauracracy. Having a full-blown task/project management software at all felt a bit heavy and bloated to me. But these content management tools just felt way too rigid and restricting–like we would have to mold our processs to their tool, rather than their tool working the way we want it to work. Asana seemed to strike a decent balance, giving us a lot of flexibility to bend the tool to work the way we need it to work. Here’s a quick breakdown on progress for each of my high-level goals for the year. Some are going along smoothly. Others are a bit behind. There’s really no beating around the bush on this one. We’re pretty far off from reaching our goal by the end of the year. 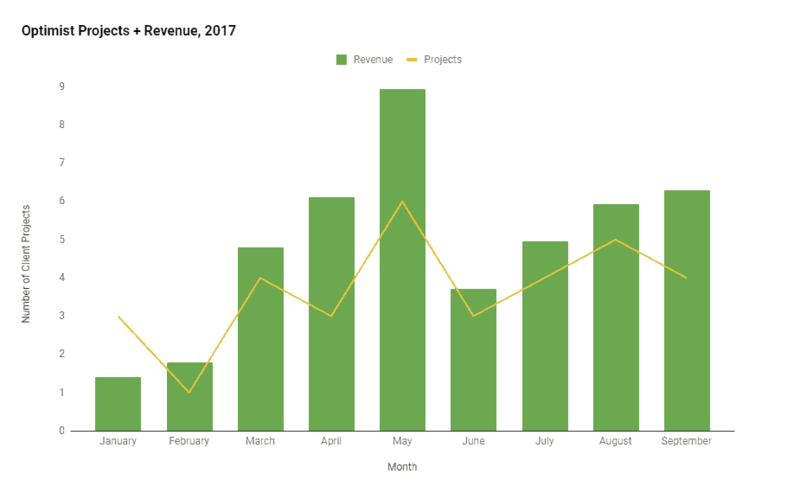 But, if we can rekindle some of the leads that are currently stuck in our pipeline and add some new opportunities, I think that we can realistically expect to hit at least 50% of our revenue goal before the end of the year. This will take a lot of work–and probably some luck–but, I think’s plausible at this point. As mentioned above, we have changed part of our content strategy. Because of this emphasis on fewer, high-quality posts, I am guessing that we will land somewhere around 20 posts for the year. To make up for this, I’m going to bump up our goal for guest posts. I have maintained a fairly health guest posting and writing schedule, pitching posts to a number of outlets and websites throughout the year. But, the bulk of my guest posting has come from my monthly column on StartupNation. Once we finalize our content schedule for the rest of this year, I’ll build out a guest posting plan that tracks with our focused content for each month. I’d like to increase this goal to approximately 30 targeted guest posts in 2017. Unfortunately, I think I missed much of the window for events in 2017. Many of the deadlines to submit proposals ended in the late spring or early summer. That being said, I have already begun to submit proposals for a few late events this year and early events for next year. We have not yet announced the event, but I am currently in the planning stages of a joint webinar with a strategic agency partner–should be fun! We may do a small, paid lead-gen push in the coming months to help bolster our list. But, so far, it has grown steadily every day through our content marketing and content upgrades. This is probably the goal I am most disappointed in my progress on so far. We’ve had limited cash flow to put toward any particular cause. Although I’ve made a few small donations throughout the year, I am hoping to come up with some kind of bigger campaign or cause that we can invest in before the end of the year. Have ideas for a great, worthy cause? Leave it in the comments!